If you’ve ever had the pleasure of collapsing with a coffee and a slice of cake at Lily Vanilli’s bakery, chances are you’ll already know the wonders of this cake. If not, let me share the love, and the recipe, from her brilliant book Sweet Tooth. This isn’t a cake to call on when you need a slab of something sweet and familiar, it’s something altogether more thoughtful; for those days when chic trumps comfort. Preheat the oven to 180°C / Gas Mark 4 and grease and line your cake tin. Mix together the flour, spices and baking powder and keep this to one side for the time being. Cream the butter and sugar together in a stand mixer for about 5 mins, or until light and fluffy, then beat in the eggs, followed by the olive oil. Next up, add the apple and chopped rosemary and finally fold in the dry ingredients. Fill your prepared tin with the cake mix, level off the surface and arrange the apple slices on top. Sprinkle over a fine layer of dark brown sugar. To prepare the rosemary sprigs for going into the oven, dip them in cold water and rub them in brown sugar too. Push the sprigs onto the top of the cake and then bake for 30mins. Allow the cake to cool in the tin for 10mins first then move it to a wire rack to cool completely, or if you fancy serving this warm, slice immediately and serve with vanilla ice cream. Quick tip: Not so much a tip but an observation – this cake is quite thin, around 4cm or so, so don’t panic when you don’t get a massive rise, it’s just not that kind of cake! 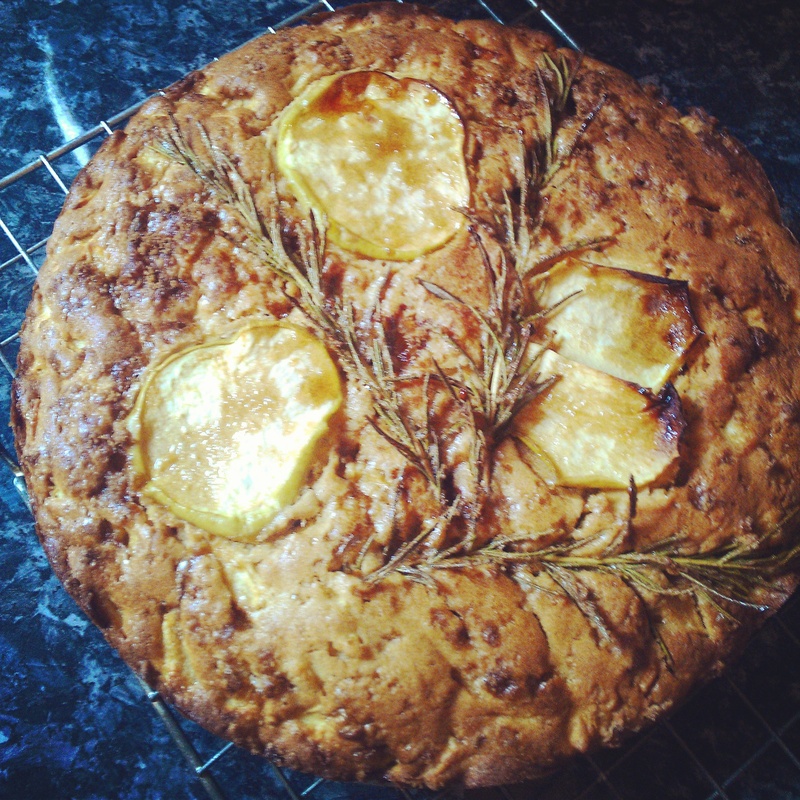 This entry was posted in Cakes and tagged apple, apple and rosemary, apple cake, apple recipe, baking, baking recipe, Cake, cake recipe, Lily Vanilli, Lily Vanilli cake recipe, olive oil cake, rosemary by Natalie Glock. Bookmark the permalink.